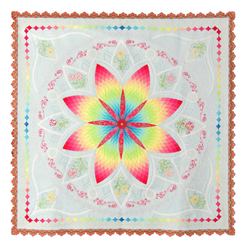 American Quilter’s Society, the largest quilting membership organization in the world, is pleased to announce the winners of the AQS Quilt Contest. $54,000 in prizes will be awarded to the winners at AQS QuiltWeek – Virginia Beach, taking place from October 3 to October 6 at the Virginia Beach Convention Center, 1000 19th St, Virginia Beach, VA 23451. As part of the American Quilter’s Society’s celebration of quilting excellence, the contest recognizes the skill and creativity of today’s quiltmakers as artists compete in the AQS Quilt Contest for $54,000 in cash awards. As part of the American Quilter’s Society’s celebration of quilting excellence, the contest recognizes the skill and creativity of today’s quiltmakers as artists compete in the AQS Quilt Contest for $54,000 in cash awards. Entries come from around the world to compete in fourteen different categories. This year’s winners come from fifteen different states and five different countries, with multiple prizewinners from the host state of Virginia. All of the winning quilts, as well as the semi-finalist works, will be on display at the Virginia Beach Convention Center for the remainder of the week. Individuals and groups who register for admission to AQS QuiltWeek will receive access to all special exhibits and the Merchant Mall with thousands of quilting items for sale. AQS QuiltWeek will be open from 9 a.m. to 6 p.m. Wednesday through Friday and 9 a.m. to 4 p.m. Saturday. Individuals and groups can register at the show. This event is open to the public. Additional information about the event and contest can be found at quiltweek.com or by calling 1-270-898-7903. The American Quilter’s Society is the largest quilting membership organization in the world. For 34 years, AQS has been the leading voice in quilting inspiration and advice. At AQS, we believe that with the proper resources, the creative individual can take their quilting projects beyond what they can imagine. For more information about the American Quilter’s Society, please visit http://www.americanquilter.com or call 1-270-898-7903.